Bakken crude oil represents light sweet crude produced from the Bakken Shale Formation in the North Dakota / Montana / Saskatchewan / Manitoba region. Production from the US side of the Williston Basin, the sedimentary basin that contains the productive Bakken Shale Formation, crossed the 900,000 b/d mark in November 2013 and was more than 888,000 b/d in February, according to the North Dakota Pipeline Authority and estimates from Bentek, a unit of Platts. 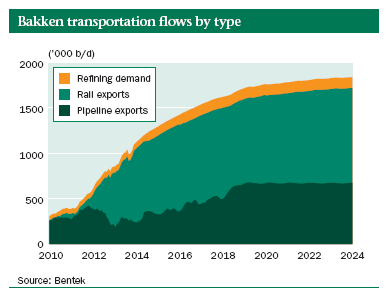 Pipeline capacity out of the Bakken is set to increase from 600,000 b/d currently to over 1 million b/d by early 2016…. California, country’s biggest gasoline market, more than doubled the volume of oil it received by train in the first quarter as deliveries from Canada surged. The third-largest oil-refining state unloaded 1.41 million barrels in the first quarter, up from 693,457 a year ago, data on the state Energy Commission’s website showed last week. Canadian deliveries made up half the total and were eight times the number of shipments a year earlier. Supplies from New Mexico jumped 71 percent to 173,081 barrels. Those from North Dakota slid 34 percent to 277,046. West Coast refiners including Tesoro Corp. and Valero Energy Corp. are developing projects to bring in more oil by rail from reserves across the middle of the U.S. and Canada to displace more expensive supplies. Crude production in the federal petroleum district that includes California and Alaska, has dropped every year since 2002, while drillers are extracting record volumes from shale in states including North Dakota and Texas. The surging flows of domestic oil to California “reflect a continuing improvement in crude-by-rail receiving facilities here,” said David Hackett, president of Stillwater Associates, an energy consultant. Rail shipments still account for a small fraction of California’s oil demand. In February, the state imported more than 20 million barrels of crude from abroad, according to the U.S. Energy Information Administration. Crude from North Dakota and Canada trades at a discount to Alaska North Slope oil, which rose 36 cents to $107.78 a barrel in early trading on Friday. Western Canada Select, a heavy, sour blend, gained 36 cents to $82.88. North Dakota’s Bakken crude also gained 36 cents to $95.28. It costs $9 to $10.50 a barrel to send North Dakota’s Bakken oil by rail to California, according to Tesoro, the West Coast’s largest refiner. Trains are bringing more oil to California even as projects face more regulatory scrutiny after a series of accidents involving rail cars carrying fuel. The most recent was on Wednesday, when a CSX Corp. crude train derailed in Lynchburg, Va., igniting a fire that led to an evacuation. A derailment in Quebec in July killed 47 people. The U.S. Transportation Department is studying changes to shipping oil by rail, and in February railroads agreed to slow such trains in urban areas. Canada ordered a phase-out of older tank cars last month. Officials in Benicia said Thursday that they’re delaying until June an environmental report on a rail-offloading complex that Valero has proposed at its refinery in the North Bay city. The San Antonio company originally planned to finish the project by the end of last year. Tesoro is six to eight weeks behind schedule in receiving regulatory permits for a rail-to-marine crude trans-loading terminal in Washington state, the company, also based in San Antonio, said Thursday. It now expects to receive the permits late this year or in early 2015, with construction taking about 12 months, Scott Spendlove, the chief financial officer, said on a conference call with analysts. Alaskan oil output has declined every year since 2002 as the yield from existing wells shrinks. Lynn Doan is a Bloomberg writer. DENVER (AP) — The U.S. energy boom is blurring the traditional political battle lines across the country. Democrats are split between environmentalists and business and labor groups, with the proposed Canada-to-Texas oil pipeline a major wedge. Some deeply conservative areas are allying with conservationists against fracking, the drilling technique that’s largely responsible for the boom. The divide is most visible among Democrats in the nation’s capital, where 11 Democratic senators wrote President Barack Obama this month urging him to approve the Keystone XL pipeline, which is opposed by many environmental groups and billionaire activist Tom Steyer. The State Department said Friday that it was extending indefinitely the amount of time that federal agencies have to review the project, likely delaying a pipeline decision until after the November elections. Several senators from energy-producing such as Louisiana and Alaska have distanced themselves from the Obama administration, while environmental groups complain the president has been too permissive of fracking. There is even more confusion among Democrats in the states as drilling rigs multiply and approach schools and parks. California Gov. Jerry Brown was shouted down at a recent state convention by party activists angry about his support for fracking. New York Gov. Andrew Cuomo has kept fracking in his state in limbo for three years while his administration studies health and safety issues. In Colorado, Gov. John Hickenlooper has drawn environmentalists’ ire for defending the energy industry, and a ballot battle to regulate fracking is putting U.S. Sen. Mark Udall in a tough situation. But the issue cuts across party lines. Even in deeply Republican Texas, some communities have restricted fracking. In December, Dallas voted to effectively ban fracking within city limits. Those technological advances have made it possible for energy companies to tap deep and once-untouchable deposits of natural gas and oil. They include refinements in hydraulic fracturing, or fracking, which is the injection of chemicals into the ground to coax buried fossil fuels to the surface. The U.S. is now the world’s largest natural gas producer and is expected to surpass Saudi Arabia soon as the world’s greatest oil producer, becoming a net exporter of energy by 2025. The boom has brought drilling rigs into long-settled neighborhoods, raising fears of water contamination, unsafe traffic and air pollution, and outraging residents. Pollster Steven Greenberg said Cuomo provides little notice before his public appearances because anti-fracking protesters will crash his events. Republicans blame the governor for stymieing growth. New York voters split evenly on fracking, with Democrats only modestly more likely to oppose it than Republicans. In California, Brown has a long record of backing environmental causes, but he’s drawn the wrath of some environmentalists for supporting fracking. One group cited the $2 million that oil and gas companies have given the governor’s causes and campaigns since 2006. Democrats in the Legislature have proposed a freeze on fracking but are not optimistic Brown will support it. The Democratic split is sharpest in Colorado. Hickenlooper, a former oil geologist, has been a staunch supporter of fracking; at one point he said he drank fracking fluid, albeit a version without most of the hazardous chemicals. His administration has fought suburban cities that have banned fracking, insisting that only the state can regulate energy exploration. Some Colorado Democrats worry that the ballot push is bringing energy groups who generally support Republicans into the state. One pro-fracking group has spent $1 million in TV ads. Jon Haubert, a spokesman for the group, said leaders in both parties think the measures are economically dangerous. “We look at that and say this seems to be an extreme opinion,” he said, referring to the initiatives. The ballot measures will force Democratic candidates to choose among environmentalists, labor groups and Colorado’s business community, whose political and financial support is vital to Democrats in the swing state. Udall embodies this dilemma. He’s an environmentalist in a tight re-election campaign with Republican Rep. Cory Gardner, who represents an oil-and-gas rich, mostly rural congressional district. In an interview, Udall declined to say if cities should have the right to ban fracking. “I’m not a lawyer,” he said. Hickenlooper has put in place several landmark regulations — requiring that drilling occur a set distance from homes and schools and limiting methane emissions from energy exploration. But that has not assuaged activists such as Laura Fronckwiecz, a former financial worker who got involved in an effort to ban fracking in her moderate suburb of Broomfield after a drilling well was planned near her children’s elementary school. Fronckwiecz says she has Republicans and Libertarians in her coalition, as do activists pushing to limit fracking in energy-friendly Texas. While the GOP-dominated Legislature in Texas has rejected efforts to limit drilling, activists have earned small victories in towns and cities that have limited drilling, and one big win, the Dallas vote.